It's another brand new week and I hope everyone had a great start to it! 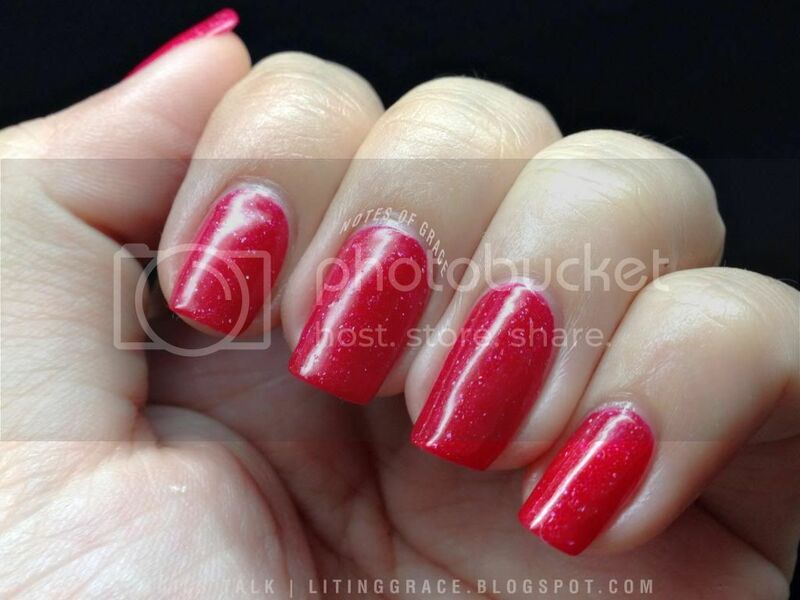 Today's Nails Talk is a compilation of my nails for Chinese New Year. For those of you who are following me on Instagram, you will know that I had participated in a Chinese New Year mani challenge, #CNYMAD otherwise known as CNY Mani A Day. For this particular challenge, we had to wear a different color associated with Chinese New Year (gold, red, orange and pink) each day for the fifteen days of Chinese New Year. As much as I would like to change my mani every other day, unfortunately I didn't really have the time to do so and only managed to participate for seven days. Still, it was better than nothing. At the end of the post, I will provide information on where I bought the polishes so do check them out if you are interested in getting any of the polishes. 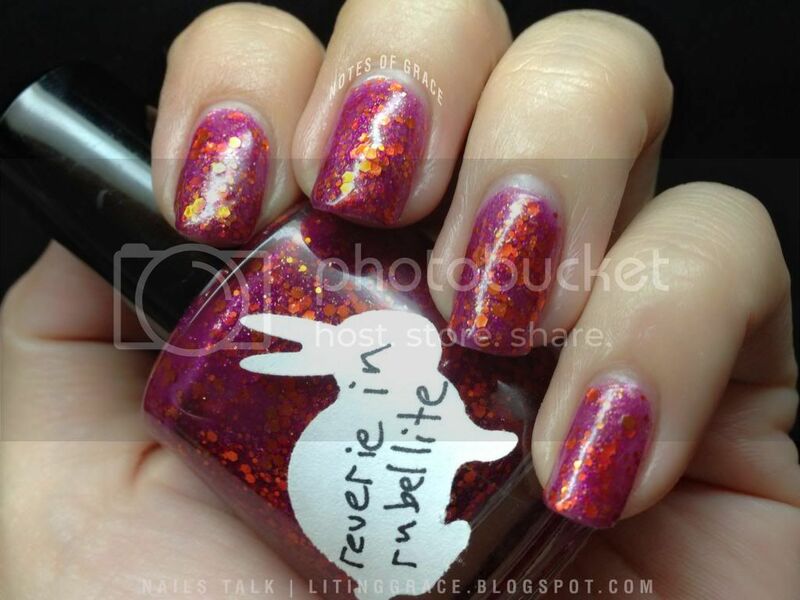 To welcome the year of the snake, I decided to use Reverie in Rubellite from Hare Polish's Fall 2012 collection, Finder's Keeper. Reverie in Rubellite is a beautiful burgundy / berry jelly base with orange hexes in two different sizes and pink micro glitter. 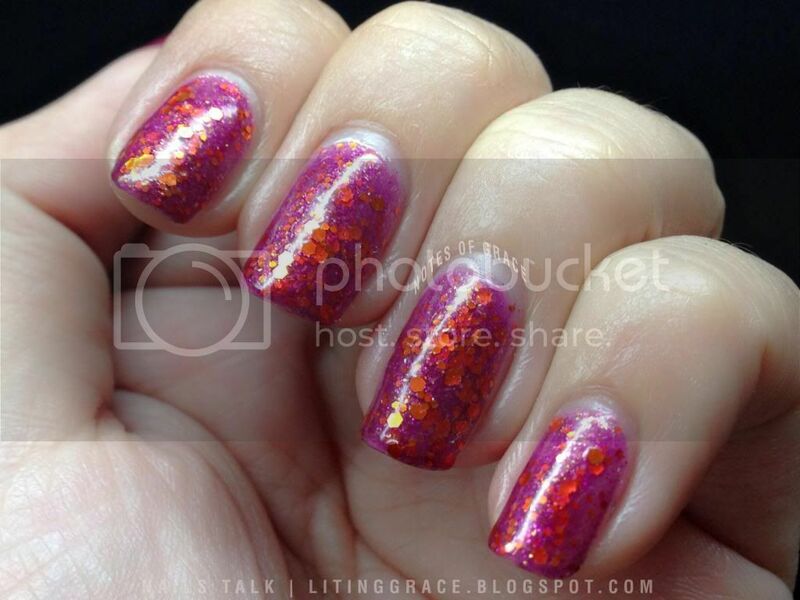 The orange hexes makes the color really glowing and the pink micro glitter really catches the eye under bright light. Formula wise was great as like the other Hare polishes that I own and application was smooth. No fishing or dabbing of the glitters was required. 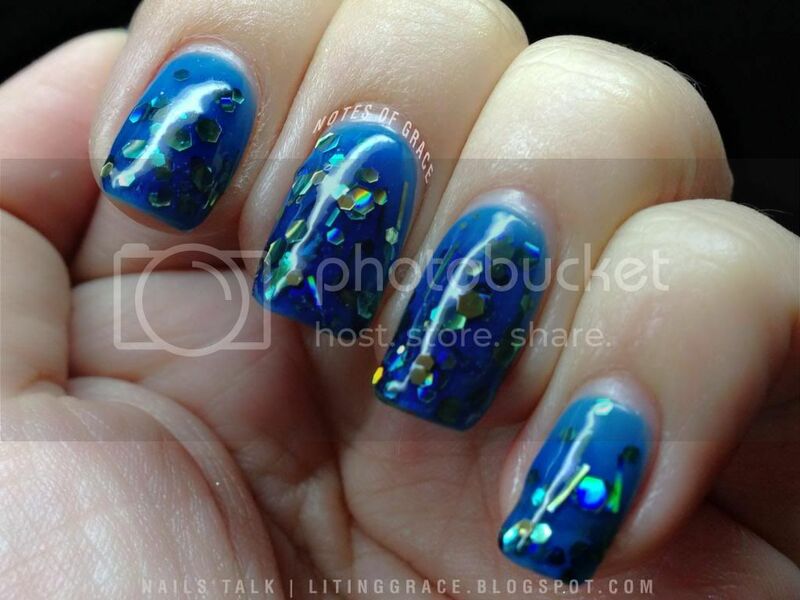 Photos below shows two coats with a coat of Seche Vite top coat and taken under a daylight lamp with no flash. 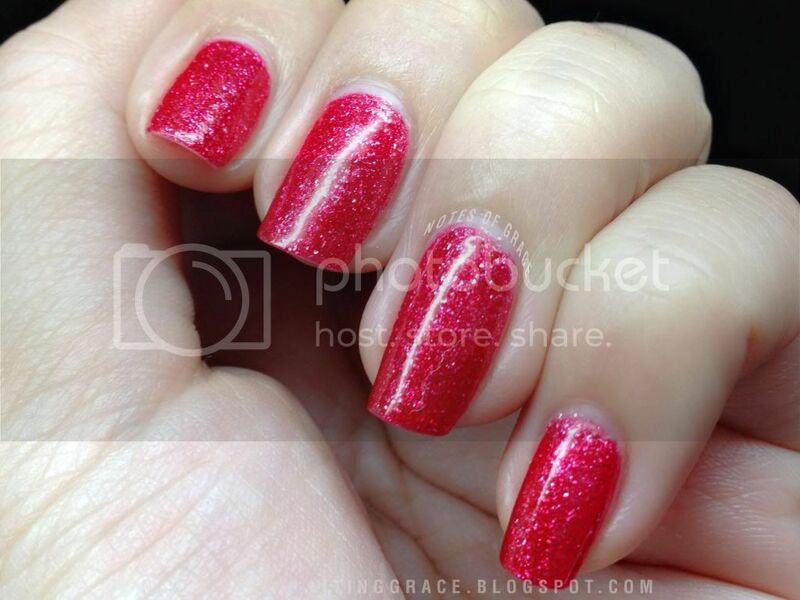 For the second mani, I decided on piCture pOlish o'hara, a cherry bright red with scattered holo. Red polishes are always my favorite and this is now one of my favorite red polishes. The formula of o'hara is similar to that of Kryptonite and required only two coats to reach opacity. The holo bits also shined through quite easily. For the third mani, I decided to use another of my untried from piCture pOlish as well. 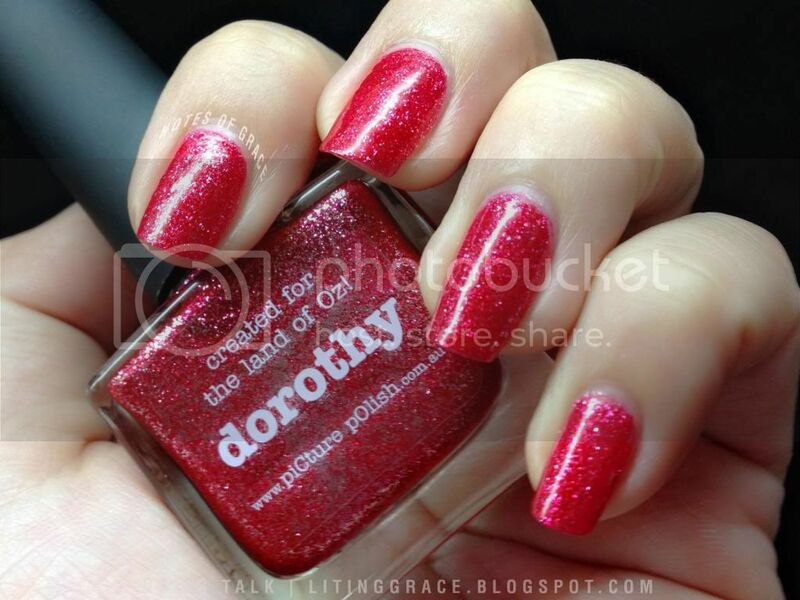 Dorothy is a red jelly packed with bright red and silver glitters. 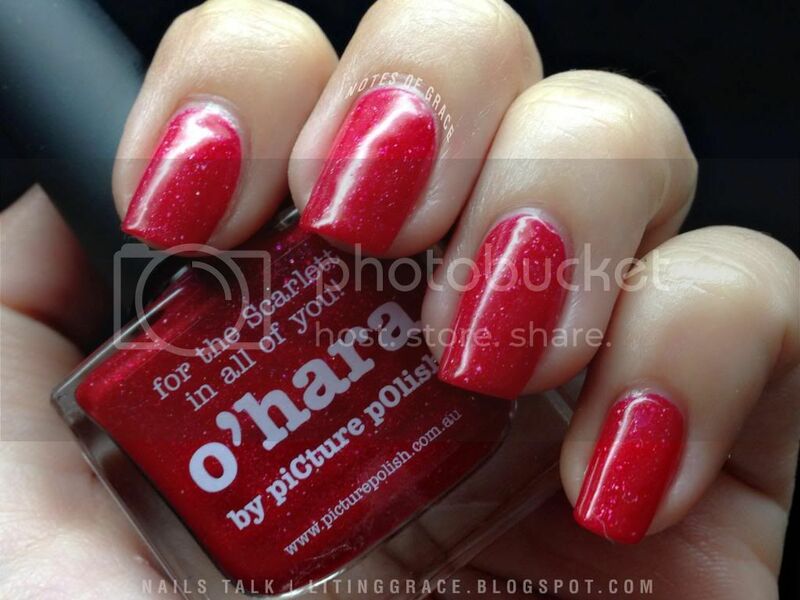 It looks similar to o'hara but leans more towards a dark pink because of the silver glitter. You can get off with one coat because it's really pigmented but I decided to go with the usual two coats plus a coat of Seche Vite top coat to give it a more opaque and smooth finish. This year's Valentine's Day was right smack in the midst of the Chinese New Year celebrations and since it's been ages since the last time I did any nail art, I decided to let the creative juices flow a little and create a set of nail art to celebrate the occasion. 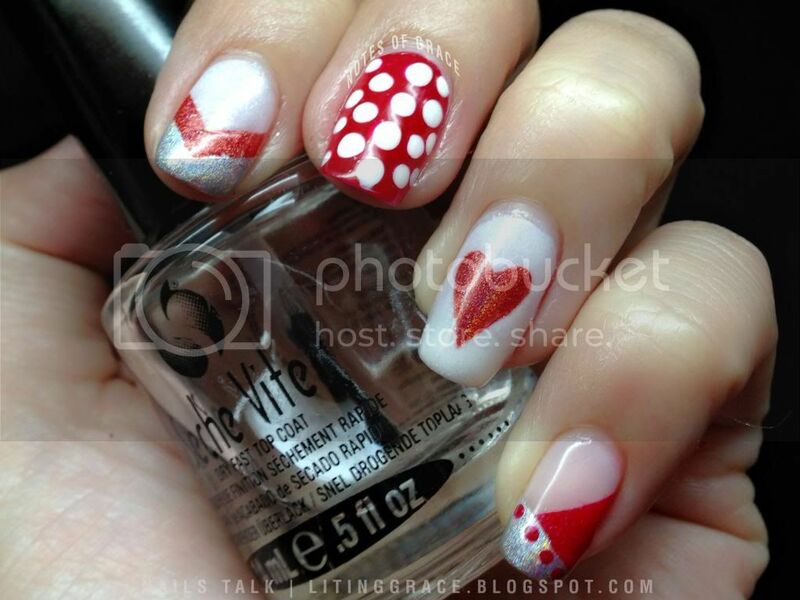 For this set of nail art, I combined my love of polka dots, stripes and chevron. For the ring finger, I decided to draw a little heart cause what's Valentine's Day without a heart right. Index finger - piCture pOlish white wedding by Llarowe for the base, Jade Holografico Vermelho Surreal and Color Club Harp on It from the Halo Hue 2012 collection for the chevron. 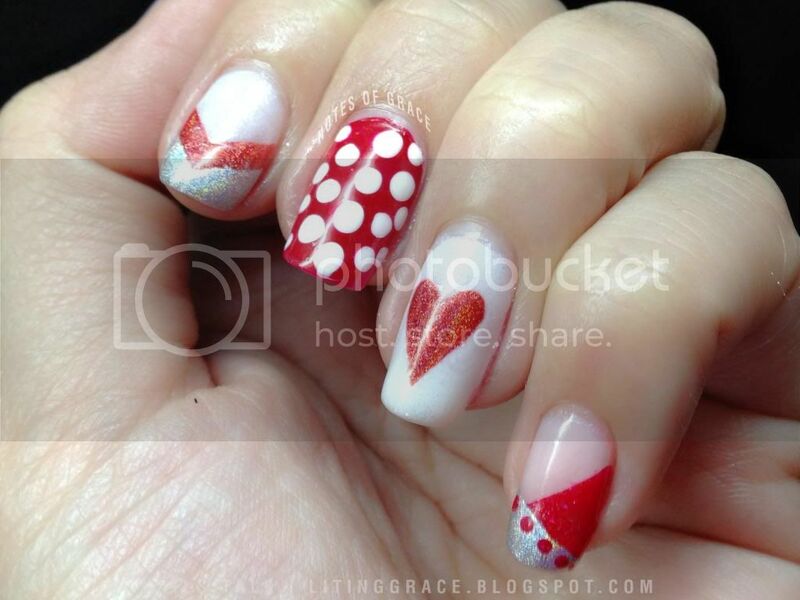 Middle finger - Butter London Pillar Box Red for the base and China Glaze White on White for the polka dots. 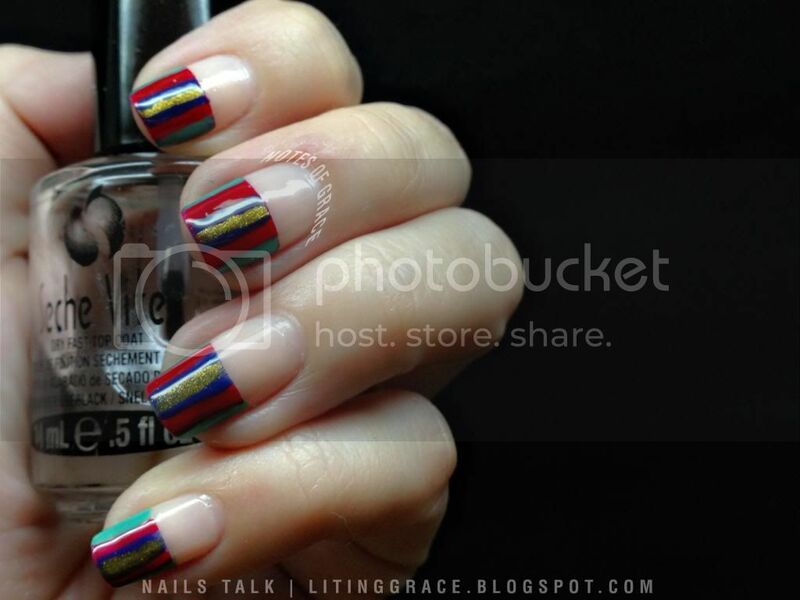 Ring finger - piCture pOlish white wedding by Llarowe for the base, Jade Holografico Vermelho Surreal for the heart. Pinky - China Glaze Faith from the United in Purpose collection for the base, piCture pOlish o'hara and Color Club Harp on It for the stripes and dots. A change of color for this set of mani and while going through my stash, I stumbled on this beauty. My Oblivion is a royal blue jelly base filled with gold holographic hexes in various sizes and bar glitters. It looks beautiful in the bottle and also when it's on the nails though somehow it doesn't really show in the photos below. Because of it's jelly base, I needed about three coats to reach opacity and application was little difficult because of the huge amount of glitters. I had to repaint the index and ring fingers cause it was a mess when I tried to paint the third coat. Despite the not so smooth application, I got to say I still love this polish. Somehow it reminds me of the underwater world with it's depth and the holographic flashes. Maybe I will try layering it over another color the next time and see if it creates another effect. As the header goes, this set of mani was inspired by Chalkboard Nails. This was also one of the designs that I spent a huge amount of time on. Being the perfectionist I am it comes to nails, it took me close to one and a half hours to complete the design and this was only for my left hand. By the time I finished the design on my right hand, three hours had flew by. It's not that perfect but I really love, love, love this set of design. So much that I wore them for a few days and couldn't bear to remove them. I'm already thinking of doing this design again but with a different set of colors. 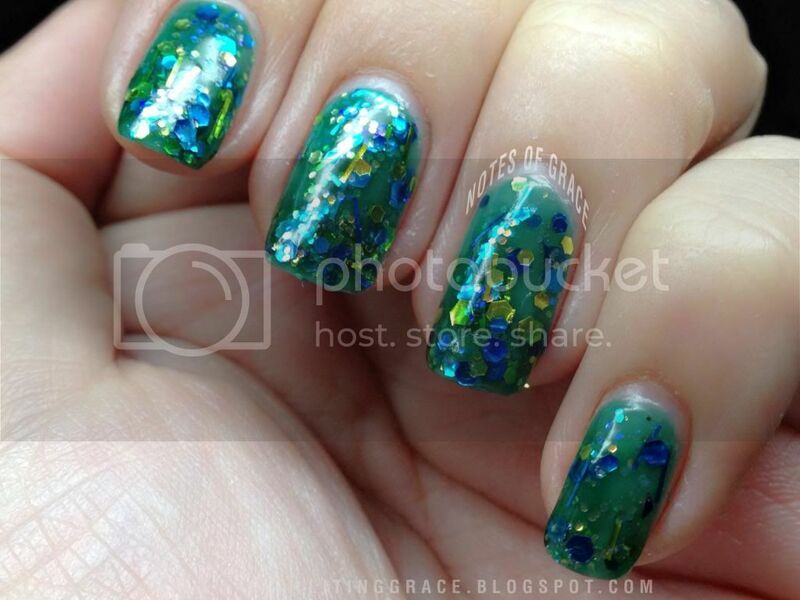 Base - China Glaze Faith from the United in Purpose Collection. Stripes - OPI Don't Mess with OPI from the Texas Collection Spring 2011, OPI Big Apple Red, OPI Dating a Royal and OPI GoldenEye from the Skyfall Collection. 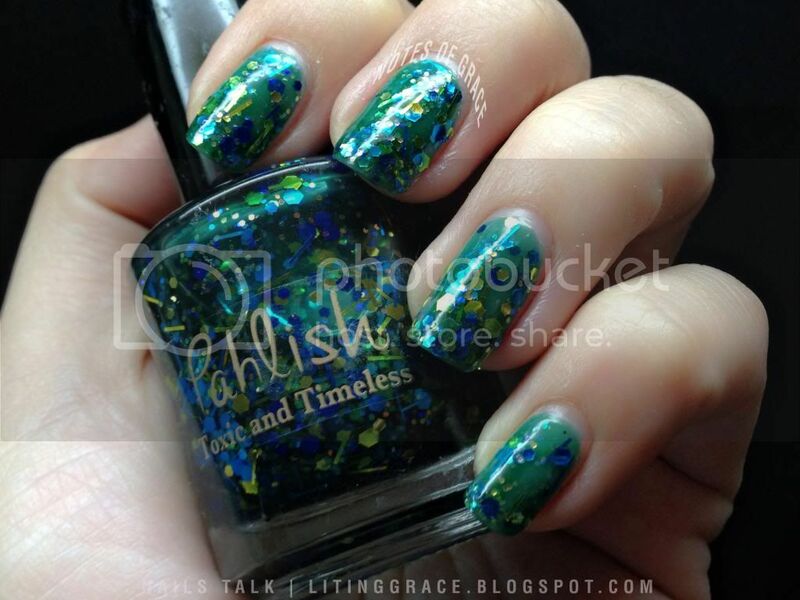 For the final set of the mani for the challenge, I chose Pahlish Toxic and Timeless. It's a glitter bomb with a seaweed green jelly base packed with small iridescent glitter, large blue/lime/chartreuse hex and blue/chartreuse bar glitter. 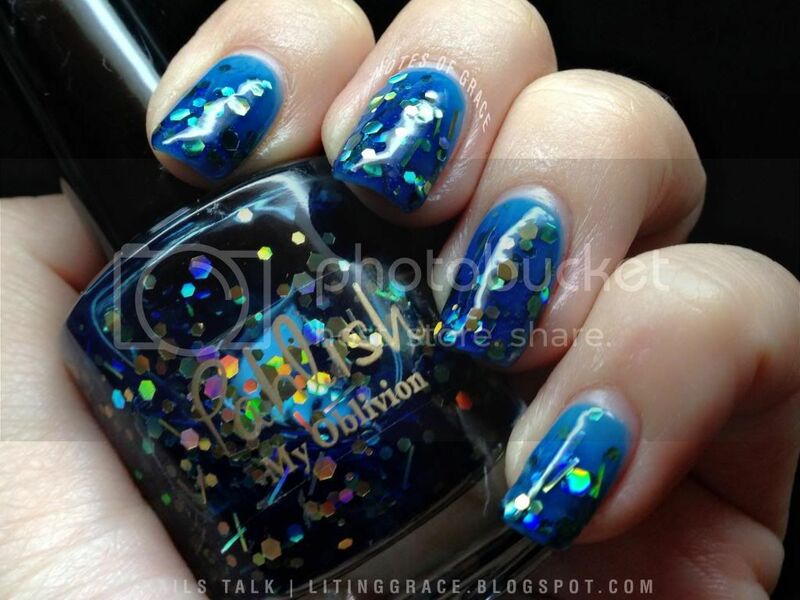 It's pretty similar to My Oblivion minus the holos. Application was much more of challenge as compared to My Oblivion because of the sheer amount of glitters and I had to resort to dabbing and pushing the glitters around. 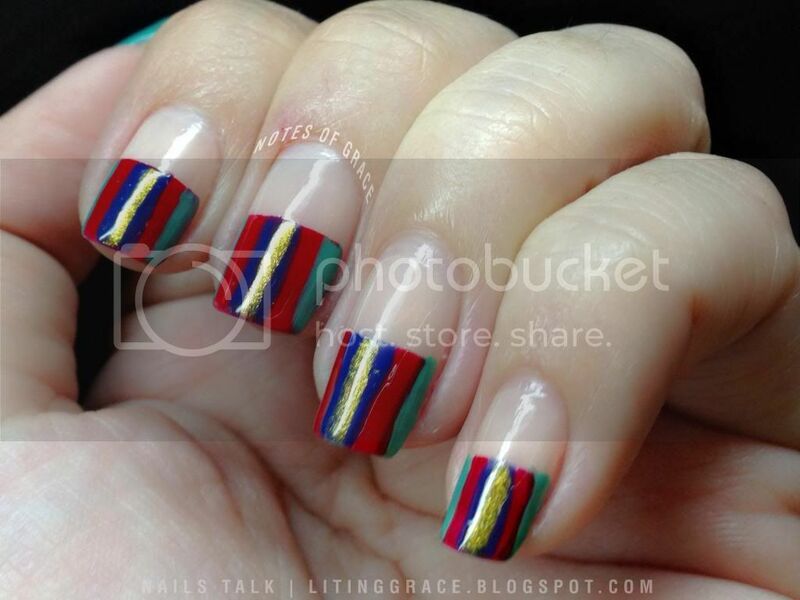 The photos below shows three coats with two coats of Seche Vite top coat.